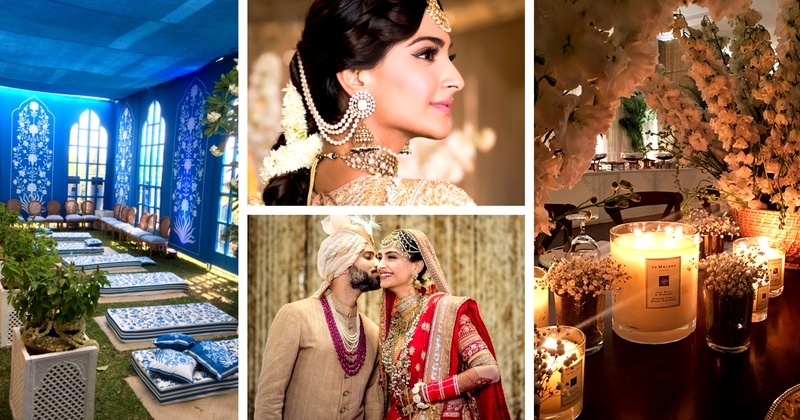 15+ trends from #Sonamkishaadi that you can incorporate in your budget wedding! Sonam Kapoor’s wedding broke all trends this year and took the internet by storm. I, for one, am still recovering from #SonamKiShaadi hangover, wondering if I can ever have a wedding like that? If you too are dreaming the same, then let me tell you, it’s quite possible to have a few elements from her wedding that too in your budget, if not all! They didn’t have a wedding hashtag, instead had a ‘love story’ hashtag. Also, it’s so cool because they just didn’t club both of their names together. They have a history of using this hashtag, since their dating days and it’s now become their official hashtag! So, have one of yours, something that defines you and make your #EverydayPhenomenal too! So, go about breaking yours too and stun everyone with a fabulous outfit! Here is some inspiration for your 2018 wedding pastel lehenga! How cute is the elephant-emojimehndi design on Ananad’s hand? Also, it’s not some random design. It comes from a long-running tradition of Sonam leaving the elephant emoji in his Instagram comments. So, if your hubby-to-be is not into the traditional designs too, ask him to get one of your emojis! Absolutely love her wedding cake,because instead of having an extravagant cake, Sonam opted for a smaller and beautiful creation. You can get a similar one too, and from the same bakery itself - Le15 Patisserie. Although, just go for some other design, because this one is a sexist AF cake top. Guys, it's 2018! Why are women still looked at as "dragging" men into marriage and away from fun? So, here’s hoping yours has a non-sexist cake. While most brides are always fidgeting, anxious and uncomfortable, Sonam just chilled in her pyjamas to get ready for the next day. Leaving behind fancy destinations and venues, Sonam had her mehndi and got married at her aunt's bungalow instead! I know it wasnt a regular bungalow - it’s a heritage property that goes by the name Rockdale located in one of the poshest areas of Mumbai, Bandra Bandstand. But given the fact that the Kapoor princess could have easily pulled off a more grand & luxurious venue, she proved that it's your wedding is all about celebrating your special day with your loved ones, and not about where you celebrate it! Budget tip: You can splurge a part of your venue budget on decor and have the wedding of your dreams, just how Sonam did. Just look at all the thought process gone in the decor. It’s part dreamy and part perfect! P.S, the decor is totally DIY-able! Yeah, her decor not only looked good, but smelled good as well. Jo Malone ensured that! Her venue was scented with personalized scents by Jo Malone London. The Mehndi’s white-themed décor was complemented with the freshness of ripe pears, lifted with peppery basil, aromatic white thyme and the zest of limes from Jo Malone London’s signature collection. This is something that we definitely dont focus on in our wedding functions, thanks for the top Mrs. Ahuja! For the wedding, the scent of pink peonies laced with red apples, jasmine, rose and soft, sensual blush suede set the stage for #SonamKiShaadi. Such an awesome and affordable idea! You don’t necessarily need the big brands do the deed for you, you just need to be creative around it. Totally vouch for this. Swap the magnanimous phoolon-ki-chaadar for a simple and stunning one. P.S, it is you who needs to be in focus not the heavy chadar! Brides these days are aiming for unique lehenga colours like pastels, midnight blue, emerald green and what not! But Sonam in her beautiful red lehenga just proved why red will always be the perfect colour for a bridal outfit. Budget tip: So, forget all the big designer names, and a pick a red lehenga that your gut tells you too. Anand Ahuja and Rhea Kapoor nailed the fine line between style and comfort with their sneaker-traditional wear combo. Take notes people, if you have to be on your feet all the time, dancing, hopping and meeting everyone, opt for a comfy pair like these two over here! The Kapoor babies had this moment of sibling love in the midst of all that chaos. You have got to have some epic selfies, as a remainder to your wedding day! Shoutout to Sonam chilling in a kaftan at the after-party. Her bridal jewellry is going to be the heirloom pieces that she plans on passing it on to the Gen X Kapoor-Ahuja clan. P.S. totally digging her multi-layered matha patti and it’s definitely going to be one of the biggest bridal jewellery trends in 2018. Sonam opted to wear the traditional kalire of course, but the fashionista wore floral kaleere too! Yes, you heard it right - floral kaleere by Floral Art by Srishti and it definitely looks stunning! I hope by know you know what ideas to steal from #SonamKiShaadi for your own wedding!